Reggie sniffs at the Rose Canyon Fault at the Tecolote Recreation Center. We had a Baby Earthquake rattle the ground beneath us Friday night, serving as another reminder of the seismic energy that continues to build, shape and mold the California landscape. Ten years ago I interviewed Dr. Pat Abbott, professor emeritus at San Diego State University, for my Treehuggers International show. Pat is one of the region’s best-known seismology experts, and anytime there’s a tremor that we can feel here in San Diego you’ll likely see Pat and his characteristic mustache on TV news in the aftermath. He’s sort of the Yoda of San Diego seismology. 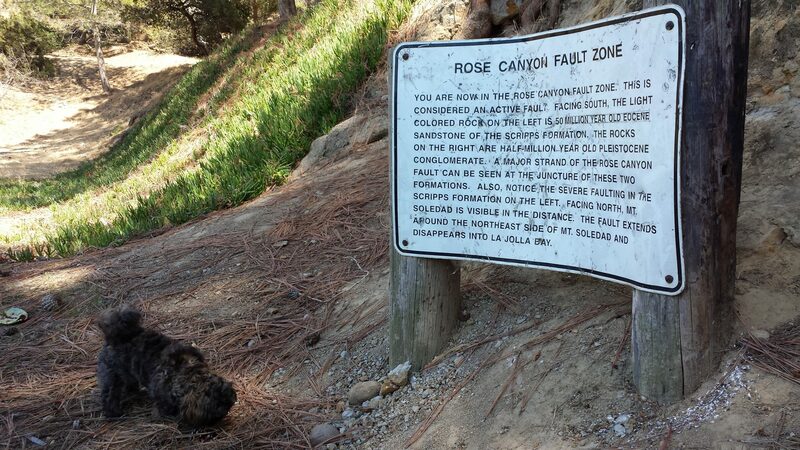 When I interviewed Pat for Treehuggers International, one of the topics we covered was the Rose Canyon Fault, and how it’s responsible for a myriad of geologic features that we take for granted in San Diego. In particular, as the fault bends with the rest of Southern California, the west side of the fault “catches” against the larger mass of California on the east side of the fault, and warps the landscape – resulting in a series of geographic high points and depressions that line up one after the other along the coast. North of Mount Soledad the Rose Canyon Fault veers offshore, but not before creating its namesake canyon, which I-5 goes through north of Mission Bay with the massif of Mount Soledad to the west. A little to the south of the canyon, along the road into Tecolote Canyon, you can actually walk up to the fault in the hillside along the playing fields at the Tecolote Recreation Center. 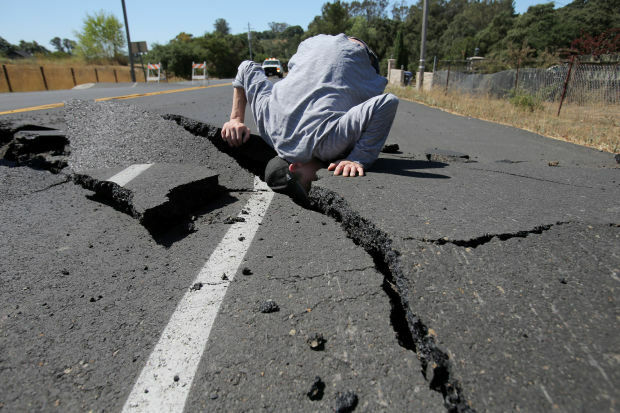 Now, new research at the UCSD Scripps Institution of Oceanography confirms what Pat was talking about on my Treehuggers show in 2007 – that the Rose Canyon Fault is only a portion of a much larger, more notorious agent of chaos: the Newport-Inglewood Fault. The Newport-Inglewood Fault is known to be capable of producing a damaging, destructive earthquake within the 6.0 to 7.4 magnitude range, but according to the Scripps Institution of Oceanography the Newport-Inglewood and Rose Canyon faults taken together could also produce a jolt as severe as a magnitude 7.4. That would be the most serious earthquake in San Diego history if anything like that struck here. Interestingly, it was an earthquake along the Newport-Inglewood Fault in 1933 that resulted in the Field Act, one of the first pieces of legislation that mandated earthquake resistant construction code for all of California. While some level of code for quake-resistant construction came together following the Santa Barbara earthquake of 1925, the building codes were typically at a local level, seldom enforced and weren’t mandated statewide. It wasn’t until the Long Beach Earthquake along the Newport-Inglewood Fault on March 10, 1933, that lawmakers took action when public buildings and schools were destroyed from Whittier to Compton to Culver City. 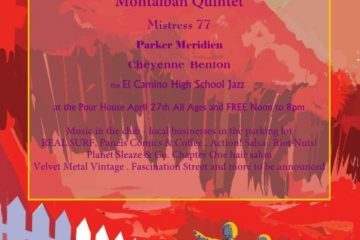 Fortunately the quake occurred after school hours, but it was clear from the destruction wrought on schools that had the Long Beach Earthquake – which killed 120 people as it is – occurred earlier in the day the dead and injured would have been in the thousands. 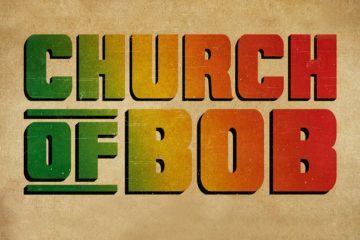 Want to see something interesting? Here’s an outtake from a W.C. Fields movie that was being shot on a soundstage in Hollywood at the time of the 1933 earthquake. 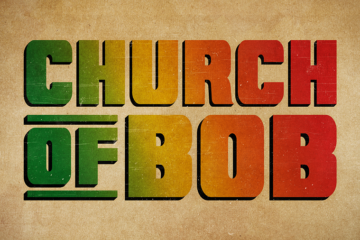 The camera and sound kept rolling for a moment even as the actors and crew quickly left the set. 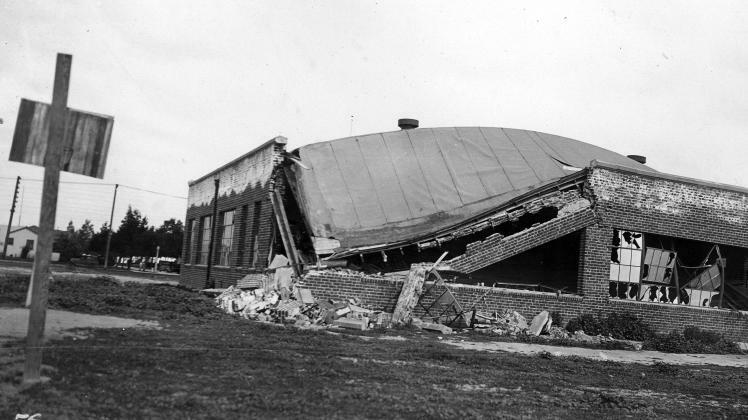 Damage from the 1933 earthquake at John Muir Elementary in Long Beach. 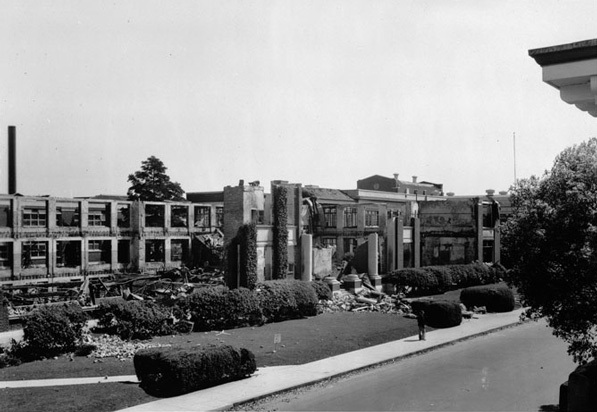 Compton was one of the harder-hit area in 1933, where Compton Junior High was destroyed. 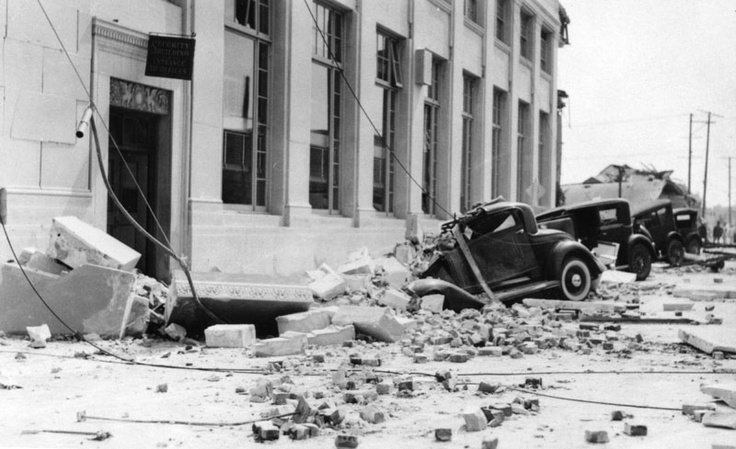 Damage at Venice High School in L.A. following the 1933 quake. 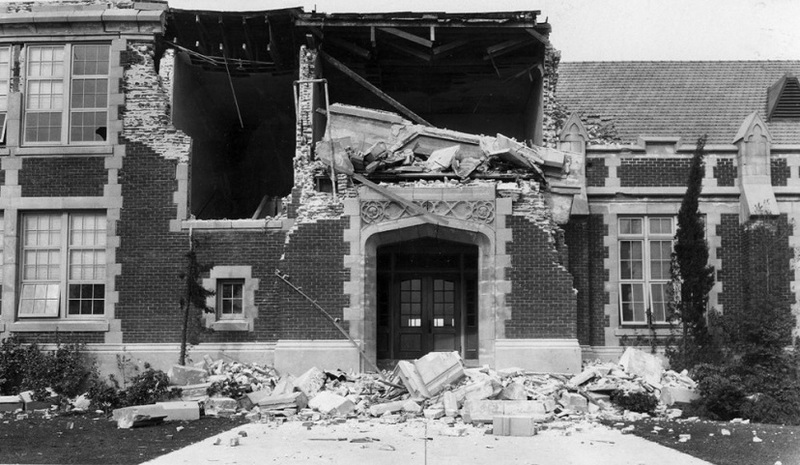 Huntington Park High School was a total loss after the 1933 earthquake. Photos courtesy of the California Institute of Technology and the California Division of Mines and Geology. 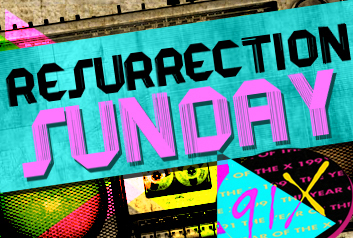 Danielle can be heard on 91X every weekday morning from 5:30am-10am.